Have you ordered the new course? Just released! I have created the new ABAP Objects course and it is available to you for an early bird half-price discount for a limited time. 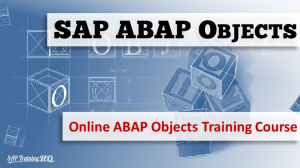 This is your opportunity to learn ABAP Objects for the best discount available anywhere..
Watch the first video and see if you qualify to take the course. If you do, take this limited time early bird opportunity. The full course has just been reviewed and approved by Udemy and is ready for you to download or watch online now.